It’s nice to see a film that plays with the usual Hollywood tropes yet at the same time expose something rather truthful about the way the system works, and suddenly the in-joke being presented hits you. Robert Altman, a director who always was searching for a manner to go against the norms amidst the studio influence gives a clear picture of what harm it does to the most valuable thing behind what forms what we come to view; the visions. Amazingly, The Player chooses never to head into the territory where it would highly offend anyone working within the business, but there’s a uniqueness to the satire we’re finding here that just allows it to stand out from other films that poke fun at the system, especially with what it hides under. 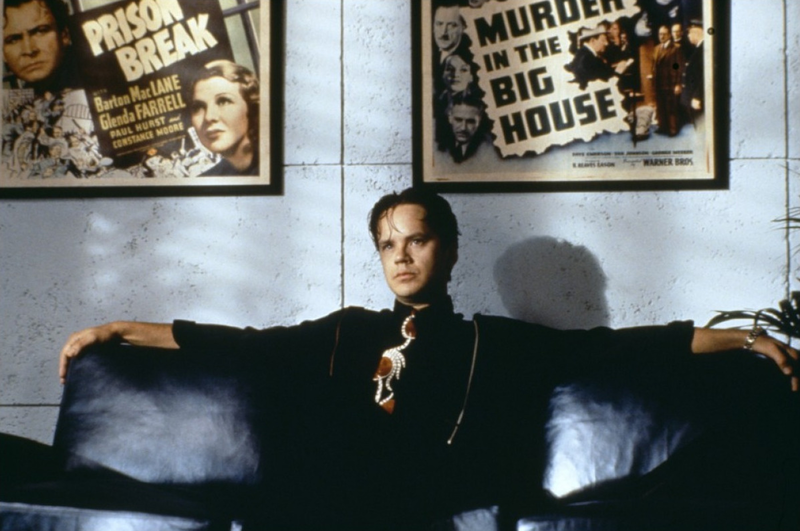 Tim Robbins as studio executive Griffin Mill in The Player. A basic understanding of the system comes from how the studio executives have a bad reputation with the screenwriters. Tim Robbins’s Griffin Mill is a man who embodies what is, on a general basis, so disliked about these people. We see that he’s getting postcards that include death threats, and they come from a writer whose pitch he had rejected. He goes for one writer he believes is sending him the death threats, and accidentally murders him, and now he’s getting so much buzz because he’s the prime suspect. It’s an exaggerated picture of what is so immensely hated about people like him, and to a specific extent, we also find that Griffin Mill is a sympathetic person. The film’s opening scene, a long take that lasts a little more than eight minutes, is a perfect setup for what comes afterward. In this single take, it introduces the meta nature of the film in its first frame, which shows the slate. This scene was shot fifteen times, and the take which had been used in the final product, was the tenth take. In spite of our knowledge that this is indeed a work of fiction, the small things that this opening shot emphasizes (a postcard which writes “Your Hollywood is dead!” on the front) show that The Player is a satire that is very much in touch with capturing Altman’s knowledge behind working for a Hollywood studio, and seeing him sharing this knowledge is where the wonder behind such a cynical film comes in. Griffin Mill, the whole time, gets himself caught up within a mystery that is very Hitchcockian in nature, but the in-joke became clear within the moment a picture of Alfred Hitchcock becomes the focus of our attention. It’s apparent that the surrealism of these Hollywood tropes that Altman has so clearly familiarized himself with only becomes a part of where The Player most noticeably carries a meta approach behind the way in which it was made. There’s an artificiality to specific elements that come in, one most noticeably being the romance, but when we’re taken in with how Robert Altman shows all of it to us, there’s a clarity that what we’re seeing was indeed done on purpose, it’s a film that mocks the familiarity of Hollywood. It certainly helps that Michael Tolkin’s screenplay is so intelligently crafted from beginning to end. Much like Robert Altman, Michael Tolkin, who wrote the novel in which The Player was based on, understands what is so loved within Hollywood’s biggest hits and very openly, it is mocking the nature of it. The cleverness to this script comes from the appearance which it bears on its outside, but by the ending, the realization becomes clear. The hero is a man who gets the girl, and then there’s a happy ending. Where The Player decides to do something much differently is that with the nature of our own protagonist, a more cynical vision becomes clear as the nature of these endings is turned upon its own head, because there’s a self-reflexive approach that makes this version of “Hollywood’s happy ending” so refreshing. Audiences love this sort of stuff, that’s what ended up screwing up the final product of Adrian Lyne’s Fatal Attraction (another in-joke that caught my mind with the film-within-the-film’s altered ending). Hollywood says people much like these are heroes. The Player opens up with a possibility that maybe there’s something more that we aren’t aware of when we watch our heroes on the screen. From the manner in which it turns the Hollywood tropes which the general audiences from all sorts have made themselves grow to love all this while on its own head, what’s created is a Hollywood film that gives the finger to how the system works. Even today, it still bites at how we’re shrouded in familiarity, and all throughout, it’s consistently very funny. After what’s been made clear by the ending, the best way to describe it is how Richard E. Grant’s Tom Oakley was to pitch his script, “That’s reality.” It’s a film playing with what we love to the point, maybe something darker was behind it after all.